According to reports, international news giant CNN, a unit of Time Warner, is in talks to acquire the social news website Mashable for $200 million. Mashable, an American news website and news blog founded by Pete Cashmore in 2005, specialises in technology and social media. However the blog now also covers business and entertainment. Mashable is said to have over 15 million monthly visitors and 4 million social media followers across Twitter, Facebook and Google+. 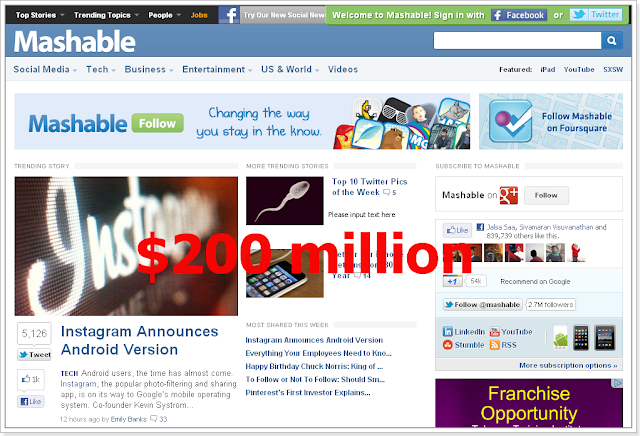 The Reuters blogger Felix Salmon has learned from an unnamed source that CNN will buy social media website Mashable for more than $200 million. The source said that the announcement is expected for Tuesday. However, according to New York Times, officials at CNN denied that an announcement would be made on Tuesday. Also, spokespeople from both CNN and Mashable declined to comment on the potential acquisition. If the rumours turn out to be true, this will be the latest in the chain of tech news site purchases. If CNN acquires Mashable, it will, however, be the highest amount paid for a tech news site.